Schaeffler Group owner Maria-Elisabeth Schaeffler wants to become supervisory board chairman at Continental, the Financial Times Deutschland reported Friday, citing a company insider. 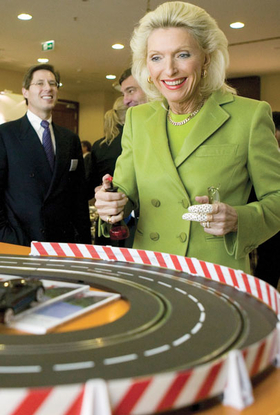 Mrs. Schaeffler, 67, would replace current Continental chairman Hubertus von Gruenberg, 66. On January 20, Schaeffler called for Von Gruenberg's resignation as head of the Continental board accusing him of sabotaging integration of the two German suppliers. Separate reports in the German media said Continental Chief Finance Officer Alan Hippe would quit the supplier to join Europe's largest steelmaker ThyssenKrupp. Schaeffler and Continental have been in a bitter power struggle since Schaeffler launched a hostile takeover of Continental in July 2008. Schaeffler controls 90.2 percent of Continental's shares. The takeover saddled Schaeffler with a net debt of more than 10 billion euros. The company has been pressing for an integration of the Schaeffler and Continental automotive businesses to create synergies and to help it finance its debt. Continental called an emergency supervisory board meeting for Saturday, January 24, after Schaeffler demanded Von Gruenberg's resignation and threatened to force out all 10 investor representatives of the 20-member body. With targeted annual sales of 25 billion euros for 2008, Continental, of Hanover, Germany, is one of the top global automotive suppliers. Schaeffler, based in Herzogenaurach, Bavaria, makes bearings, engine components and clutches under the INA, FAG, Luk brands. In 2007, Schaeffler's revenues were 8.9 billion euros.